Bradley Justus’s practice focuses on antitrust law, including mergers, antitrust litigation, government investigations and counseling. He has significant experience representing parties to large global M&A transactions. 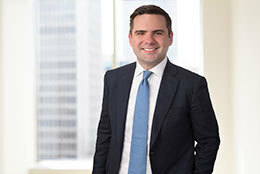 In addition to appearing before the U.S. Department of Justice and Federal Trade Commission, he has represented clients in merger reviews by the European, Brazilian, Canadian, and Mexican competition regulators. Bradley also has extensive experience defending clients in large monopolization litigation, as well as cartel investigations and follow-on suits. Prior to joining Axinn, Bradley was an attorney at a global law firm. He clerked for Judge Eugene E. Siler, Jr., of the United States Court of Appeals for the Sixth Circuit. While attending the University of Virginia School of Law, he was Editor for the Virginia Law Review. JD - University of Virginia School of Law (2010); Editor, Virginia Law Review.